They say that the first man to cross the river probably used a log, but I’m not so sure. If you’ve ever tried stepping onto a floating log then you’ll know that it’s not easy; as soon as you put a foot aboard, it starts to spin around. Myself, I think that the first palaeolithic sailor used half a dozen logs which he lashed tightly together – and in northern Brazil there are people who still put to sea aboard the descendants of such craft. This traditional jangada is in a museum in southern Brazil. The rafts of Fortaleza and the north-eastern coast of Brazil are called jangadas, and the totally traditional ones were assembled from six baulks of timber. No screws or metal nails were used in the construction; the inner planks were fastened to each other using wooden pegs and the outer ones were lashed in place using hand-made ropes. Present day janagadas are not quite so primitive – but we’ll talk about that in a minute. The jangadas carry a decent-sized triangular sail, whose mast pivots in a rustic but cleverly designed tabernacle, and to limit their leeway they’re fitted with a simple daggerboard. The helmsman of the jangada steers his vessel with an oar – and he doesn’t just pootle about on the river; as I say, these things go to sea. 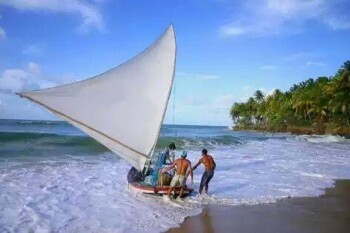 The Brazilian fishermen who are the proud heirs to the jangada tradition will happily sail two or three miles offshore at times. 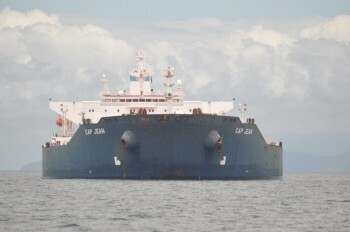 In fact, I’ve heard it said that they venture as much as 40 miles offshore. And then, having got where they want to go, they drop the mast and they sit there, right in the path of the ocean winds and the ocean currents and the ocean travelling container ships. João Martins sails a jangada. 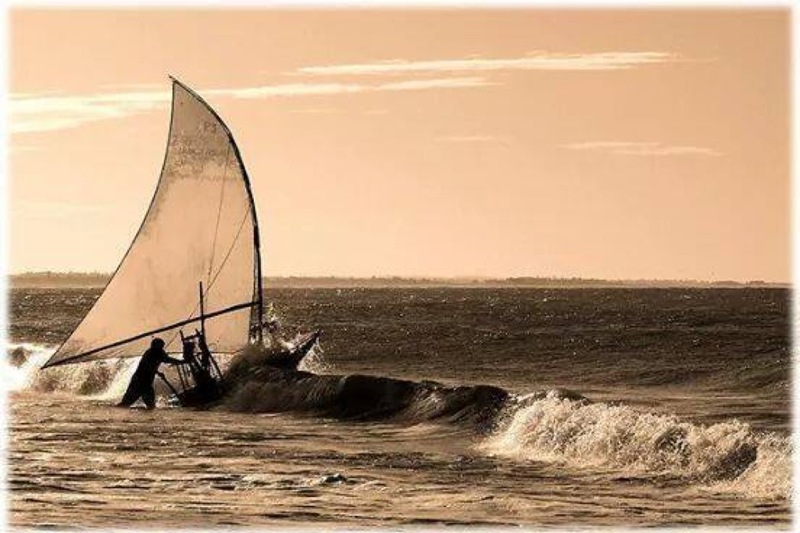 His father was a peasant farmer, but he and his brothers preferred the idea of earning their living from the sea. 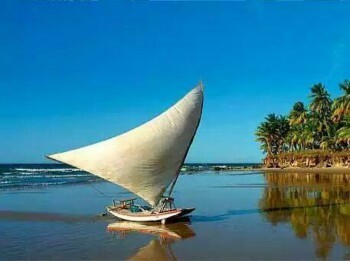 For the past 25 years and more he has launched his raft from the beach in Taiba, near Fortaleza, and set out through the reefs towards the ocean. Until recently he had his own raft but he now sails with a friend. Traditionally, the jangadas put to sea as a fleet and remain there for three or four days. Sometimes there might be only one man aboard – certainly, the only jangadas that I have seen had only one man aboard – but I’m told that the bigger ones generally carry two, three, or even four fishermen. Given that even the biggest rafts are only about seven metres long with a maximum beam of around two metres this is obviously not the career for anyone who needs even a modicum of privacy, and nor would it suit someone who likes to stroll about or stretch his limbs. Imagine being pinioned there, with two or three others, for four days…! The men sit, each in their own small patch, and dangle their lines in the water, and whatever they catch they share equally with the owner of the raft. Generally, this will be one of the other jangadeiros, but in some instances the vessel belongs to another party. I’ve heard it said that those jangadeiros who fish in the shallower coastal waters are after lobster and that the ones who go offshore are after flying fish, but as a general rule the men seem happy to catch whatever they can, and they return home with a motley collection of colourful reef fish. At night the fishermen simply lash themselves to the raft and lie down. Evidently, they must take it in turns… but even if the deck were big enough to allow them all to sleep at the same time they could not afford to risk it. Like the rest of us, they have to keep watch for other traffic. The beaches whence João Martins and his colleagues launch their sailing rafts are now thronged by bronze-buttocked sunbathers, and kitesurfers, jet-skis, and snazzy powerboats go blasting past them as they make their way out through the surf. One cannot help but admire the jangadeiros, who carry on regardless – but one wonders for how much longer they will endure. Besides the fact that the fishermen’s sons are likely to be seduced into following more lucrative and less ascetic pastimes, there is the real, physical threat to their existence. As you can see, there’s no cabin atop that raft. There’s nothing except a wooden stool. So the sailor has nowhere to hide from the sun, the wind, or the waves. Moreover, because there is no structure, the first sight that his fellow seafarers have of a jangada is of the man’s head, seeming to bob about above the waves. 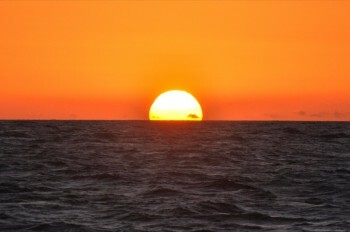 And how do you feel about being all alone on a plank in the sea as the sun goes down? The idea of sitting there, all alone on a board in the vast sea, has obvious appeal – particularly in the case of the lone jangadeira. Whereas we cruising yotties are on nodding terms with the ocean, the man who puts his trust in a log and who lets the waves wash over his body is like Moses standing before Yahweh. But having very nearly run one down with Mollymawk, I’m obliged to state that a janagada is not a very safe place to be. João Martins’ children wish that their father would give up the life of a fisherman – but they’ve been wishing for a long time. Now 24 years old and with kids of her own, Angela Martins still recalls the time when her daddy failed to return home. Unexpected bad weather had created a big sea, and his jangada capsized. 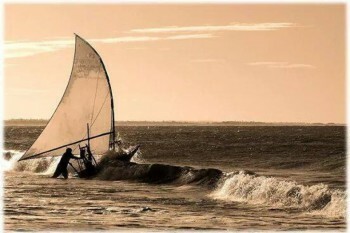 There was no possibility of righting it, and so João and his companion found themselves clinging to the upturned hull. Throughout the following day and night their physical and emotional stamina must have been tested to the very limits, but it would seem that their karma must have been well in credit. From the deck of a passing ship the over-turned raft would have been almost invisible – it would have looked like a large brown turtle hovering at the surface – but an eagle-eyed look-out spotted it, and the men were saved. The traditional jangadas were built from a wood which is similar to balsa. (The Portuguese word for raft is actually balsa, and that surely demonstrates the link.) Like balsa wood, the timber is light and buoyant; and like balsa, it eventually soaks up water. Thor Heyerdhal noticed this problem while he was crossing the Pacific aboard Kon-Tiki. His raft was gradually sinking. 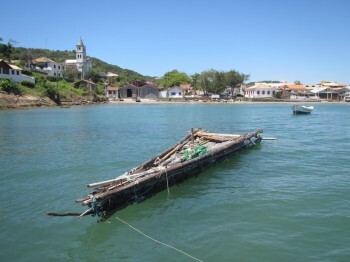 The fishermen of northern Brazil used to get round this problem by slipping their boats at the end of every expedition. Even so, it is said that the traditional rafts last for less than eighteen months. When the free-for-all on felling was ended, in the 1950s, the Brazilian fishermen could no longer help themselves to whatever trees they might need to build their boats. Since balsa wood and its equivalents are highly valued internationally they became very expensive. Although light and soft, they are actually “hardwood” trees, and they take a long time to grow. 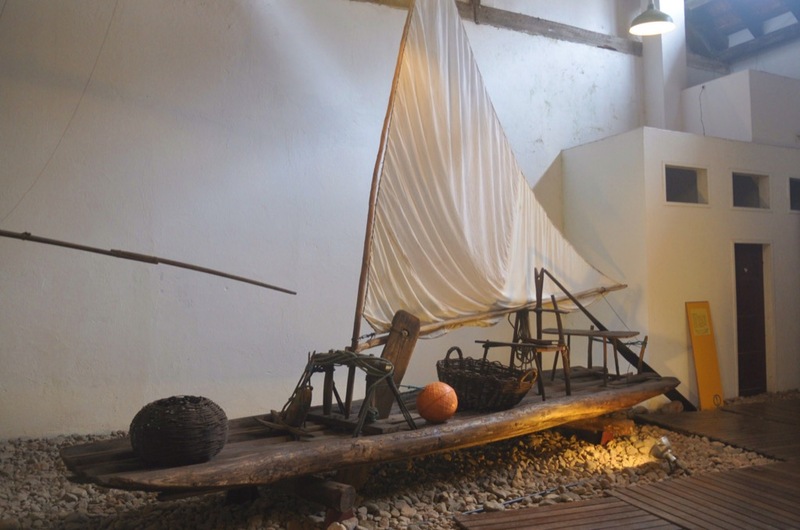 This effectively finished off the traditional jangada, and it would have pushed the vessel and its creator into extinction – except that boat-builders are adaptable creatures. 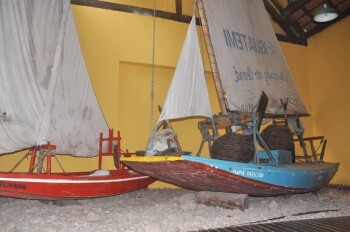 The modern janagadas are built from planks and have a hull and deck with a small cavity between them. They look like a cross between the old raft and a Laser racing dinghy. They cost in the region of £1,700 (2,300 Euros / 2,700 US$) – that’s the price for a brand new one! – but although it might sound like peanuts, it’s a lot of cash for a peasant fisherman to find. Almost by definition, a peasant lives hand to mouth and has nothing left after he’s bought his groceries. Tabernacle,with several slots in the board at its base, to allow various mast angles. Also visible are the daggerboard keel and the primitive anchor. What are the origins of the jangada, and why is it only found on this north-eastern corner of the continent? More so even than America and Britain, Brazil is really lots of countries rolled into one giant corporation, and the northern provinces are as different from the southern as Senegal is from South Africa. Obviously, there’s a climatic difference. They may not be as far apart as Alaska and Texas, but Manaus and Porto Allegre still get widely differing weather, the one being sunk in the sweltering tropics while the other even experiences snow. However, the main difference between the two regions is cultural – cultural and financial. Whereas the population of the Amazon region tends to live in wooden huts and travel by bus or by canoe, the people of Rio Grande do Sul have modern houses and drive their own cars. Given this difference one is not surprised to find that the Southerners don’t want to go rafting on the ocean… but perhaps their ancestors used to? Climatic differences are bound to lead to adaptations which, in time, become cultural foundations. However, in this case it seems that there was actually very little difference between the coastal dwelling indios of northern Brazil and their cousins living to the south. They had become divided into several tribes, but they were all Tupis. They all spoke the same lingo and made the same pottery and ate their enemy’s warriors. They all used dug-out canoes. And rafts…? No. 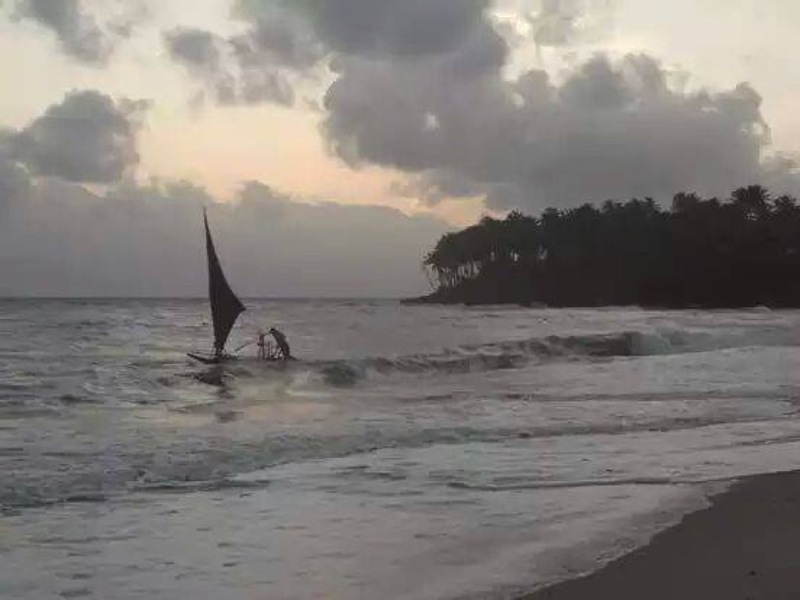 Seemingly, there is no mention anywhere of the Tupi using sailing rafts. So – again we ask ourselves – whence came the tradition of rafting, and were there ever jangadas sailing off Brazil’s southern coast? When the Portuguese arrived on this coast the people had no sailing craft. Two hundred years later, jangadas were all the rage. What happened in the interim? Well, what happened was that the Portuguese sailed to and fro between Europe and India, stopping off on the way to do business in Madagascar, Mozambique, Cape Town, and Brazil. And their business involved trading in people; and some of those people are likely to have been peasant fishermen. 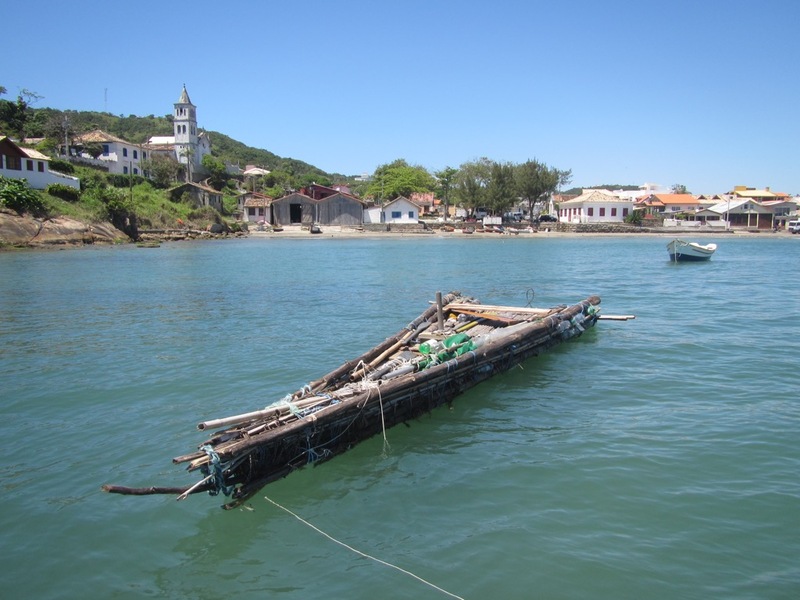 Throw in the idea that Mozambique fishermen are said to have used sailing rafts, and we seem to be following a hot trail. Add the fact that these rafts were called changgadam… and I think we’re almost home and dry. Most historians favour this Eastern-trade story as the explanation for the origins of the jangada, but I’d like to throw in another one. As anyone familiar with the Kon-Tiki story will know, there were certainly sailing rafts on the west coast of South America in pre-Columbian times. 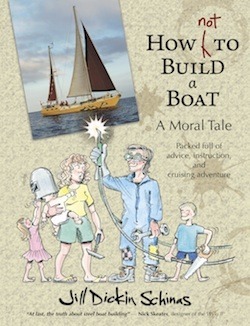 It was on a Peruvian raft that Thor Heyerdhal based his ocean-going vessel. 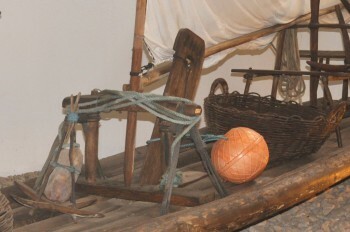 The Peruvian rafts were as different from the jangadas as a dug-out is from a clinker-built dinghy; but further to the north, in Ecuador, the fishermen used a simple three-trunk raft which looks very much like a small, rather primitive version of the old traditional jangada. Indeed, it seems that a few of them are still using this kind of vessel. It is steered with an oar, it has a daggerboard; it even has a fore-and-aft sail, whereas the Peruvian trading rafts had square-sails. Could the technology have been brought over the mountains, and down the Amazon, and along the coast… or is this merely a coincidence? In the end one has to resign oneself to the fact that the trail has grown too cold to follow. All that can be said is that the jangada is probably a multi-cultural invention. It evolved on the north-east coast of Brazil because it is ideally suited to this region of sandy beaches and warm waters. More to the point, it evolved here because it was here, and not in the more temperate, southern parts of the new continent, that the colonists set up their sugar plantations; so it was here that they settled the Malagasy and Mozambique slaves who, according to the accepted theory, introduced the technology. It is said that jangadas were also used in the southern provinces until the Portuguese stamped them out. According to the history books, the authorities were trying to prevent gold smuggling and so they banned all and any vessels which didn’t have a warrant. Well, to be honest I can’t see anyone managing to smuggle much gold aboard a six-plank raft… certainly, I can’t see that it would be possible to smuggle any more with this type of vessel than with a dug-out canoes – and yet the tradition of building dug-outs is still strong even in the areas where the gold ports were established. The significant feature of the north-eastern coast of Brazil is the steady as clockwork wind, which enables a jangaderio to reach out from the beach and then reach back in again. The coast in the region of Rio and Ilha Grande doesn’t enjoy this facility; this region is prone to fog, calms, almighty squalls, and a general irregularity which would make offshore voyaging in a raft most precarious. And the sea further south is just too cold for this sort of game. Mind you, not everybody sees things this way – not everybody considers that blue-water rafting is a tropical pastime – and our last photo shows the raft built by a Brazilian friend residing in Garopaba. As you can see, it’s a vessel even more primitive than the genuine jangada. Indeed, it makes plain the sophistication of that rustic pile of logs. 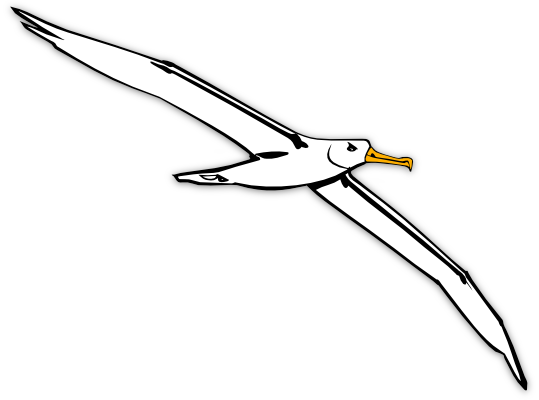 We’re hoping that Celso won’t set out in an offshore wind – because if he does, I don’t think the Pterodactyl will make it back into the bay. With thanks to Fábio Arruda for the photographs of the jangadas launching from the beach in Taiba. In the next chapter of this story of Brazil’s traditional boats we will show you the fastest dug-out canoes in the world.